The ‘Pictures of Sightings 1 and 2’ show a variety of the sightings as according to location. ‘Pictures of sighting 1’ shows instances solely in Cairo and surrounding districts, whilst ‘Pictures of Sightings 2’ are outside of Cairo, but still in Egypt. 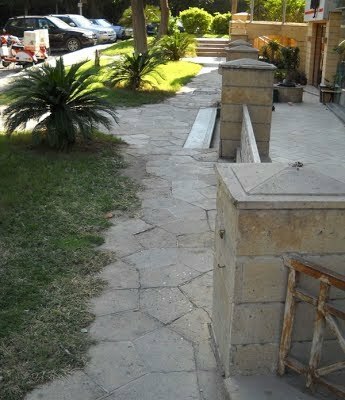 A variety of pictures are shown, of the overall view, rather than a detailed pictures of the paving units. Various types of sighting are shown, of ad hoc appearances, where these appear to have simply been used to fill in a missing arbitrary paving and notable landmarks, such as at the Cairo tower (and everything in-between), and both extant and no longer in existence. These are shown in alphabetical order for the sake of general ordering, although category is at whim in places. 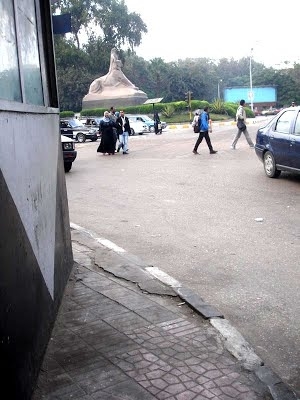 Where a sighting is prominent, such as the Cairo tower, this is placed there, rather than its district (Zamalek). Although broadly the pictures essentially do not need comment, on occasions this is added to clarify certain aspects, or to discuss aspects of interest. Unfortunately, with the ravages of time, with some sightings in books and articles of twenty, thirty years or more ago, it is unclear if these are still extant. Where I am certain on this or otherwise, I state accordingly, with extant in brackets. The pictures are derived from a variety of sources: the Bibliotheca Alexandrina website (specifically of the President Gamal Abdel Nasser and President Sadat collection and film footage). and books, articles. Other contributions were obtained from some of my investigators in the field, significantly Helen Donnelly, Gregg De Young, Pam Garnett and Yasmine Dorghamy, and the Rare Books and Special Collections library at the American University in Cairo. A drawback of the Bibliotheca Alexandrina sightings is that the pictures are not in the public domain. Instead, of necessity, I provide links to the pictures. Quite what all this means in the context of the investigation is unclear! 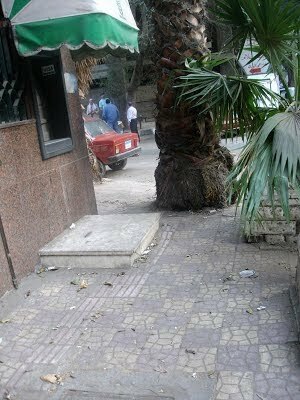 Some areas have significant instances, such as Maadi and Heliopolis, whilst others have none (or at least appear so). Further complications are that Cairo is seemingly in a constant state of building/renovation/development. Being obviously utilitarian, the pavings are obviously deemed expendable, and can disappear in a moment (as has been witnessed). And furthermore, with the passage of time, with the date of instigation beyond all reasonable doubt at least of the 1940s, change is inevitable. All these aspects hinder research. Was there a central contract, which would explain such a preponderance of sighting in one place? Many aspects below are left open-ended. I would be most pleased to receive details arising from the following. A sighting of the utmost significance is at the Al-Galaa club, in Heliopolis, as this is the earliest documented date, of 1957 (from photographic evidence). The occasion was the opening of the club by President Nasser. Therefore, it would seem unlikely to have been in place previously here. Whether this is still extant is uncertain. 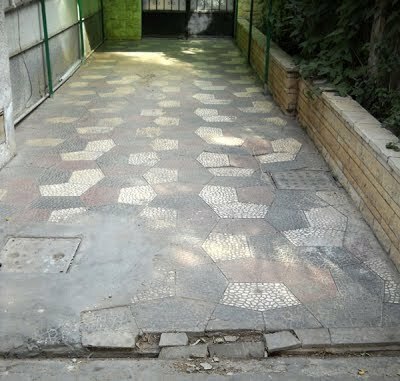 Note that the paving is widely seen in Heliopolis, as discussed below. Details here are sketchy. This sighting was reported to me by James Dunn, upon my asking for clarifications as to his account of the tiling in the Mathematical Gazette of 1971, upon a 1969 visit. However, there is no documentary evidence of this. Indeed this is now almost certainly no longer extant; the airport has been considerably remodelled since then, with more terminals. Does anyone know of this? A sighting at the Cairo tower on Gezira island, in 1961 was a spectacular sight, but is unfortunately no longer extant, it having been replaced by plain paving at an unknown date. Possibly this lasted until 2004-2009 when the Cairo tower was restored. Dating this, being a prominent landmark, can be done with a degree of certainty. The pictures show various dignitaries at the opening, with President Nasser and President Tito at the official opening. The Cairo tower was built between 1954 and 1961 (the latter its opening date), and so obviously it was installed sometime of these dates. A sighting in a book, Insight Guides Egypt, 2002, page 171, by APA Publishing, in the City of Dead, featuring a mosque. Details here are sketchy. Does anyone know of this? Whether this is still extant is not known. Many instances are to be found in Dokki, of which these feature prominently near the Shooting Club and at El Behoos. Likely, these sightings are fairly modern, Dokki being a relatively recent built-up area. A single sighting, at El-Azhar University, at least of 1993, from a photo in a book. This is just a small patch, and so it is not possible to judge the extent. Is it still there? A single sighting, at the entrance to Giza zoo. This is just a small patch, and appears to have been to replace existing tiles of a different type, although possibly this is the other way round; both types of tile are shown in equal measures. Likely, ‘modern’. 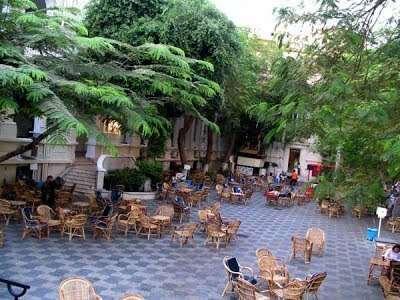 Many instances are to be found in Maadi, and indeed is arguably the best place for sightings. Indeed, seemingly every way you turn and it’s there! I have no less than 50 distinct sightings. The dates are again unclear, there is no photos in books. In this regard I consulted the Maadi historian, Samir Raafat, but he could shed little light on this. Of note is that the pentagons are without any surface decoration, the only instance of such a type. Is this seen anywhere else? This sighting, surrounding the swimming pool, is interesting in that it is of the first recorded picture in print, ‘Aramco World’ (and in colour), of 1973. An initial web search has found a further photo, of 1983. Is this still sighting extant? Are there are other such ‘swimming pool’ sightings? Heliopolis is another common place for sightings, and indeed, is the earliest confirmed date of 1957, at the opening of Al-Galaa club by President Nasser, as detailed above. A curious feature of one sighting in particular is as regards its colouration, consisting of a five colours, a feature not seen elsewhere. However, whether this is a regular colouring or a random assortment arranged ‘any which way’ is uncertain due to the ‘few in number’ of tiles of this patch. Upon preliminary investigation, it would appear as if the assembler began with an ordered colouring scheme in mind, but then lost his way, resulting in a ‘part ordered’ paving. A sighting at the Gezira Sporting club, of the pergola, is a spectacular sight, stretching as far as the eye can see, and is arguably one of the largest in extent. However, how old this is remains conjecture. That said, the possibility of notable age remains; the Sporting Club was founded in about 1883 (the exact date is a little hazy), although the paving could not possibly be from that date. A correspondent, Doris Shoukri of the AUC upon a general Cairo paving query, told me that the pavings may have appeared here, possibly of early 1960s. However, details are decidedly sketchy. A sighting outside the steps of the Indian Embassy, in 1967. Is this still extant? The American University in Cairo (AUC) Downtown Campus, near Tahrir square sightings are some most extensive, and can be seen over most of the campus (of five city blocks) and noticeably so of the Greek campus. (The AUC has recently (2008) moved to New Cairo, although retaining a link to the downtown campus.) These are of a black and white colouring, arranged in a butterfly configuration. An open question is to the date of instigation. Quite when these were installed is uncertain. Certainly, they are ‘old’, as the first photograph (from the archives) of the AUC we have, of a date of a degree of certainty, is of ‘late 1960s’. We also have anecdotal detail of earlier, from past students, with Margaret Shubka (1966) and Yerzan Terzan (1956), although with the passage of time one should be wary of such anecdotal reports. That said, the pattern is indeed striking, and not easily forgotten, and so possibly these recollections are indeed true. 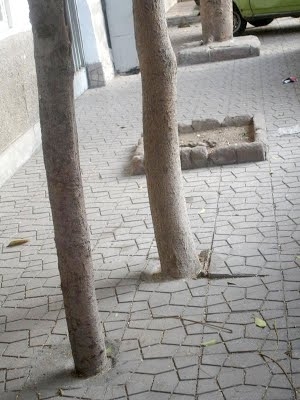 The university itself was founded in 1919 by Americans devoted to education and service in the Middle East, and so there is a remote possibility that the paving is extremely old, although likely not of the date of foundation. The university was extensively re-modelled in 1963, and so possibly the pavings date from then. Investigations with the university authorities and ex alumni to determine an earlier date are on-going. An advantage with the sighting here is that the notable nature of the AUC, with photographic archives, and many past students, and so this thus offers a possibility of dating the pavings than an sighting on a arbitrary pavement of no particular significance. A sighting in a book: Cairo The Great Cities. Of 1980. Cairo tile page 27, outside a butcher’s shop in Zamalek, of the square format. For various reasons not discussed here, a date of 1980 is accurate here. President Sadat in grounds with his portrait. 1981? The paving is seen with President Sadat, immediately for the first sixteen seconds. 1981? The paving is seen throughout video, indistinctly at first, but is first clear at 3 minutes 35 seconds. Created 18 December 2015. ‘Pictures of Sighting 1’ was originally titled ‘Pictures of Sightings’ (without the number 1), created 25 October 2011. Revised subsequently, too many times worth mentioning, and wholly rewritten 18 December 2015, with new sightings, and omission of superfluous material.